If you're heading somewhere special to celebrate this summer, why not show off your spirit with an ensemble from the shopDisney Mickey Mouse Americana Collection. From top to toe you can curl up in red, white, and blue designed that are highlighted with everyone's favorite American couple Mickey and Minnie Mouse. In addition to clothing, you'll find tableware, collectibles, and so much more! Check out some of our favorite from the Mickey Mouse Americana Collection below. Does your sweetheart dream in dots and bows? Is she a timeless classic that is always young at heart? Then you need to check out our Minnie Mouse Gift Guide to find the perfect gift for that special gal. The Dress Shop on Cherry Tree Lane at Disney's Marketplace Co-Op has been a fashionista fan favorite since it debuted it's retro-fabulous designs inspired by Disney Parks. With whimsical patterns, classic looks, and ample sizing the Dress Shop continues to gain popularity with each new release. I've been dreaming of going back to sea, as tends to happen this time of year. If like me you yearn to slow down and relax while soaking up some serious tropical sun, maybe it's time you take a Disney Cruise. Leaving from Port Canaveral (and other Ports around the world) the Disney Cruise Line offers an escape beyond compare, and I thought I would let you in on the five things that I love most. You could while away the hours, conferrin' with the flowers at Epcot's International Flower and Garden Festival in this casual meadow inspired sun dress. Pastel yellow chiffon, a pleated neckline, and gathered waist, make for a light and breezy dress that will serve you well day to night. Pair it with a soft denim jacket for casual daytime style, or simply wear it on it's own with some sparkling jewels for an evening out. You can learn a lot of things from the flowers, and one of them is that vibrant color is always in order for Spring. Step out of those Winter blues in this pretty retro dress by Wendy Bird. The peach floral jacquard fabric is embellished with modern touches like a contrasting waistline and pockets. I do love a dress with pockets! Yesterday was National Polka Dot Day, and in the world of Disney Minnie Mouse is the unparalleled first lady of dotty chic. Style a pretty black and white cotton tea dress with accessories to show off some Minnie Mouse flair. Glamour goes with you while carrying our Minnie Mouse Signature Handbag and a matching wallet. Quilted faux leather and big beautiful eyes are topped with Minnie's red bow, this beautiful bag is perfect for toting around your essentials with style. So going all out Princess in Disneybound isn't your thing? How about a dark and delightful nod to the sweet fall fruit that could have ended it all. 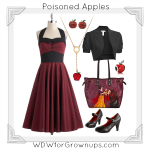 Inspired by the fantastic new Snow White and Hag handbag by the Disney Fairytale Designer Collection, this ensemble plays off of that fateful movie moment when the first Princess takes a bite of the poisoned apple. The dark burgundy dress shows retro pin-up charm with noir dots, a buttoned bodice, and halter neckline. Not every Disney girl is a princess fan, and this outfit is perfect for those foolish mortals who prefer to dance with the Pumpkin King. The comfortable jersey-knit skater dress will show you've got some spine, while accessories show off you sinister style with a scarf, bag, and trilby hat emblazoned with the Jack Skellington himself. Black, white, and purple are frighteningly fashionable this fall, making this outfit a win for touring the Disney Parks at Halloweentime.